At Budget Blinds of West Green Bay, Door County and Sheboygan, we're your local neighborhood experts that truly understand your needs. We're in your neighborhood, we know the local West Green Bay, Door County and Sheboygan weather and community, and we’re backed by the #1 provider of blinds, shades, and drapes in North America. Over 25 years of customer satisfaction gives you peace of mind that only comes with choosing the proven leader. We bring the showroom to you in West Green Bay, Door County and Sheboygan. We expertly measure your space, install beautiful window treatments, and back it up with the best warranty in the business so you can sit back and relax in the beautiful, West Green Bay, Door County and Sheboygan weather and sunshine. We serve to give you the best in window treatments, so you can rest easy knowing your space will be beautified and optimized with window treatments that fit your individual needs. 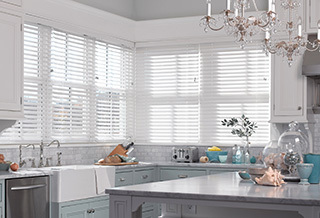 As a trusted, locally-based provider of custom window treatments, Budget Blinds serving Howard Village, West Green Bay, and the surrounding areas has been serving homeowners, businesses and residents for years. Now it’s your turn to explore what our unique, customized approach to stylish, affordable window fashions can bring to your home and your Wisconsin lifestyle. All throughout the “Martha’s Vineyard of the Midwest”, Budget Blinds serving Howard Village, West Green Bay, and the surrounding areas offers the latest trends, innovative products and unparalleled service in window coverings. And as a regular donor to Adopt a Soldier of Door County and Habitat For Humanity, we know what local means when it comes to putting our heart and soul into our community. We make your house a home with window fashions that elevate the look you’ve wanted for so long. From expert design to precision installation, our expert, highly trained designers and installers create a style and a smile for any budget. So whether you’re near Lambeau Field, or really anywhere in Door County, let our team partner with you to transform your home’s décor into something truly special. You’ll see why we’re backed by the #1 provider of custom window coverings in North America. Plus, to make it easy, we’ll bring our entire showroom to you in the comfort of your own home. Call or click today and see how the superior neighborhood service of Budget Blinds serving Howard Village, West Green Bay, and the surrounding areas will make you wish you’d called us sooner! So far we are very pleased with this company. They have been considerate, polite and helpful. Eric came to the house with samples and was patient and knowledgeable. He offered suggestions, but didn’t push his ideas. The first part of our order was installed yesterday by Patrick. (We placed a second order, later) He was quick, efficient and very kind. He called to tell us the roads would make him a few min. late. (Their warranty is great.) We were kept informed of the set up times and ordering times by the office staff, who were also very friendly. – Leroy and Diane R.
The initial meeting with Eric from Budget Blinds was excellent-professional yet personal. Deciding from the palette of colors and what type of blind would suit my home's decor was easy. I'm looking forward to the installation! Excellent products and service. Eric and Wally were a pleasure to work with.